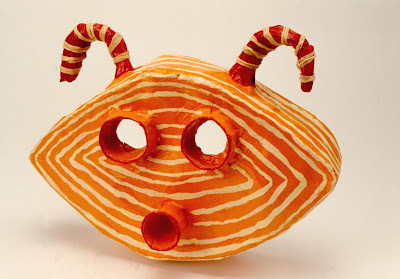 The children make masks in the style of African face masks using papier mâché. For ages 9 to 13. Plan 5 to 6 sessions. The book African Masks from the Barbier-Mueller Collection has excellent examples of African face masks. Traditional African face masks were carved mostly from wood by artists who imbued each mask with a mood or spirit, such as joy, anger, peace, astonishment, or power. The masks had a diverse set of ceremonial uses. They were worn during religious rites and celebrations, as well as for civic affairs, such as administering justice and teaching. The features of the masks were intentionally emphasized and exaggerated to be more symbolic than realistic. A major characteristic in the earliest masks is the continuity between the facial features and the mask forms, which can be seen in the flow of the nose structure into the eyebrow contour. Color is also carefully integrated into the mask form using subtle and limited color schemes. Variety of small cardboard boxes, paper towel tubes, wire, etc. Note: Papier mâché pulp adds flexibility in making the masks forms. Two full sheets of newspaper, approximately 23 by 27 inches, will make enough pulp for about 4 balls. To prepare, rip newspaper into small pieces, cover with water, bring to a boil, and simmer for an hour. Turn off heat and let sit overnight. Put wet newspaper and some of the water into a blender to make a mash. Squeeze out excess water. Mix some wheat paste to a very thick consistency. With your hands, blend enough of the wheat paste into the newspaper mash to produce pulp the consistency of stiff mashed potatoes. 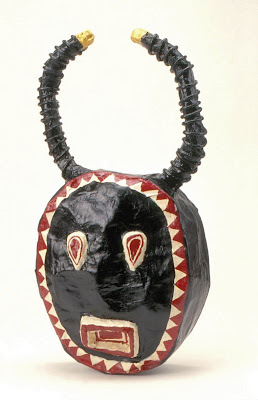 Have available examples of African tribal masks. Tear lots of newspaper into roughly 1- by 4-inch strips. Cut some newspaper into half sheets for stuffing the mask forms. Set out cardboard strips, tape, paste, newspaper strips, and half sheets. Show the children the examples of the African tribal masks, pointing out their uses and the many moods expressed in the masks. 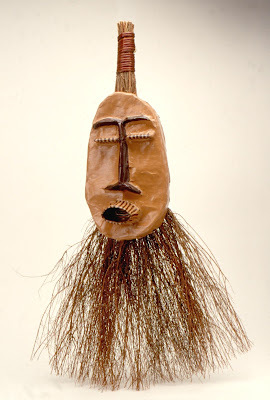 Tell the children that while most of the African masks were made of wood, they will be making masks using papier mâché. Explain that this is a process using newspaper and paste, which dries very hard. Show the children how to make the basic shapes for their masks by overlapping and taping the ends of a cardboard strip. Set the taped cardboard on the work surface, and bend it into a circle, diamond, oval, rectangle, free-form, etc. Crease the cardboard wherever angles are needed. To hold the shape in place while working, lay strips of masking tape across the top of the form, attaching them to the sides of the cardboard strip. Do this as many times as necessary to secure the shape. Turn the taped shape upside down so the masking tape is on the bottom. Fill the form with tightly wadded individual half sheets of newspaper until it is slightly over packed. If the newspaper is not tightly wadded, the wet papier mâché will cause the mask to sag. 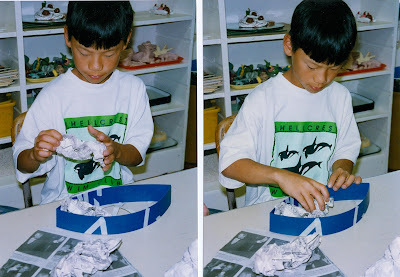 To apply the papier mâché, dip the newspaper strips into the prepared paste and pull the wet paper between two fingers to remove the excess paste. Lay the dampened strips across the form, overlapping and smoothing the edges as you go. Cover the entire form including the sides with three layers. Explain to the children that the first layer of papier mâché is the hardest. The second and third layers are much easier. Have the children apply three layers of papier mâché and then smooth the surface as much as possible before letting the forms dry. Have ready the examples of the African masks. If using papier mâché pulp, prepare a golf ball-sized quantity for each child. Set out paste, newspaper strips, tape, scissors, cardboard boxes, tubes, etc. 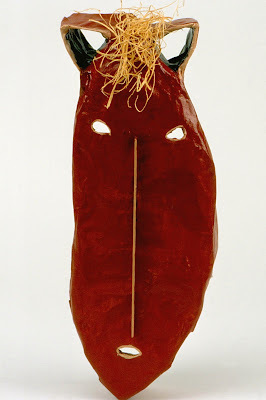 Show the examples of the African masks to the children, this time emphasizing the moods created by the facial features. Point out the simplicity of the shapes used to symbolize the mouths, the eyes, and the noses. These shapes can be cut from cardboard boxes or tubes, and added to the masks with tape. Be sure to tape along the contours of the added shapes, so they will not be lost when the papier mâché is applied. Horns can be made by tightly twisting newspaper around a piece of sturdy wire, and taping both ends to hold the newspaper in place. Bend the wire into the desired shape and attach it to the mask with masking tape. Explain to the children that papier mâché pulp is like a paper clay made from newspaper and paste. It can be used to add small shapes to the masks or to refine larger shapes. Warn the children to securely tape their additions to their masks before applying any pulp or paste. It is important that they understand that once the masks become wet, tape will no longer stick. Have the children cover all additions, including pulp and any tape used, with another layer of papier mâché, being careful to follow the contours of the shapes. Smooth the papier mâché as much as possible before letting the masks dry. 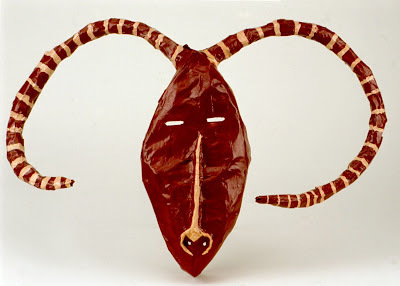 Note: If the children make long horns or complicated shapes, you will need to plan an extra session for applying the papier mâché. Have available an exacto knife in a safe place to be used by an adult. Set out tempera paints, small jars for mixing colors of paint, and brushes. Set out dried masks, scissors, and large trash bag for newspaper stuffing. Show the examples of the African masks, this time discussing their limited and muted color schemes. Show the children that they can create different values of the same color by adding white or black, and they can change the intensity of a color by adding a few drops of its complementary color, or color that is opposite on the color wheel. Warn the children that when mixing their colors, they should make enough to cover the surface of their masks. These colors can be stored in small jars and shared with other children. It’s also good to keep these colors for repairing mistakes that may occur. Have the children cut the tape on the back of their masks and pull out the newspaper stuffing. Point out that not all the masks need holes cut for the eyes and mouths. The children should decide what will work best for their masks. Eyes and mouths that are to be cut out should be done by an adult using an exacto knife. Have the children mix their colors, and then cover the entire surface of their masks with their first layer of paint. Note: Use two sessions for painting, allowing the masks to dry before adding details and designs. When the painting is completed and the masks have dried, have an adult apply a coat of polyurethane. Set out scissors, glue, dried masks, and a variety of adornments. Some children will not need to add adornments to their masks. Prepare an activity for them, such as making sketches of their completed masks and adding color with markers or colored pencils. Explain to the children that some masks will become more interesting by the addition of adornments, such as straw, shells or beads, while other masks will not need additions. Tell them that the best way to determine this is to hold items up to their masks to see how they look. Encourage the children to only add adornments that make their masks look better. Have the children attach their additions to the masks with glue and let them dry. I recommend using newspapers that are printed with vegetable inks, because they are more flexible. Newspaper strips to be dipped into paste are much easier to smooth if torn rather than cut. Newspapers tear easily when ripped vertically. The process of stuffing cardboard shapes with newspaper, rather than using molds, allows for more individual expression in the masks. Half sheets of newspapers are easier to handle and control when stuffing the masks. If possible, show the children examples of the old, traditional masks which were made to be worn and actually used in ceremonies. Be careful that the children don’t become carried away with adding shapes to their masks. If the forms become too complicated, it takes much longer to cover them with papier mâché. Some children will not need to use papier mâché pulp, while others will need extra. A golf ball-sized quantity per child usually balances out. What moods do the masks evoke? How did the artist of each mask convey its mood? Discuss some modern day ceremonies for which these masks might be used. My mask is too wet, and is starting to sag. Oops. I put pulp on my mask first and now the tape won’t stick. When I made these big horns, I forgot I would have to cover them with papier mâché. Papier mâché is harder to paint than I thought. I planned how I want to paint my mask, and I will need to use a lot of colors. I really like these beads. Do you think they will look good on my mask? If your mask gets too wet, put on one layer of dry newspapers to soak up some of the extra paste. You must remember to do all your taping before using any pulp or paste. If you forgot, you can make the rest of your forms with the pulp. Be sure to cover any additions with another layer of papier mâché. If you finish early, perhaps you could help someone else apply their papier mâché. When painting on papier mâché, sometimes you have to dab into the cracks and bumps to get the paint to cover. You as the artist can choose your colors. Just remember that we are making masks in the style of traditional African face masks. Hold the beads up to your mask to see how they look. Only use adornments that make your mask look better.